Quality eight-track recording at a competitive price but you might miss having an FX processor onboard. Ease of use; CD-quality audio recording. Display hard to see; live audio from stereo mix input cannot be recorded to master track; no FX processing. More than likely due to the rise in computer recording, we are not seeing quite as many new self-contained hardware studios released as we once did. But the genre is still going strong - particularly at Tascam, the pioneers of the whole personal studio revolution with the original Portastudio. It has just brought out two new digital Portastudio models: the DP-02 and the lower priced DP-02CF. The DP-02CF records to portable media in the shape of a Compact Flash (CF) card and a 1GB card is included. This is an eight-track machine in that it can play back up to eight tracks of audio but recording is limited to two tracks at a time - either as two separate mono tracks or in stereo. The dual input channels each sport an XLR socket complete with phantom power to accommodate condenser mics as well as 6.4mm jack inputs - the jack input on channel A being switchable to Hi-Z (high impedance) so you can plug a guitar straight in. 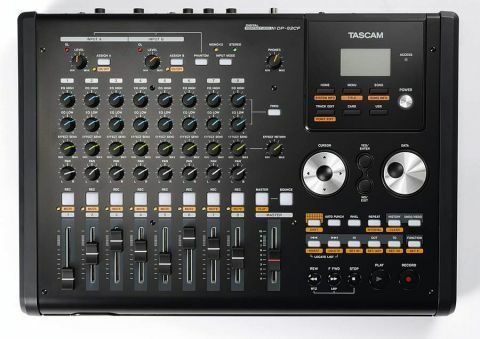 Tascam has never been strong on drum machines or sampled beats in its recorders, but you do get a metronome that will either generate an internal sound or send out a combination of two MIDI notes (one for the start of the bar, one for each beat) to an external drum machine. The audio output from a sequencer or drum machine can be brought in through the stereo mix input to be mixed with the recorded tracks at the machine's stereo output, or it can be connected to the A and B inputs and recorded. While other companies utilise virtual tracks in their machines, Tascam doesn't implement this here at all - what you get are just the eight tracks which, while not being quite so versatile, may be less confusing to use and could be seen as a good thing in the way that it concentrates the mind on making on the spot musical decisions about whether a performance is good enough rather than recording loads and choosing one later. Onboard are all the basic editing facilities for cutting, copying and pasting audio - enabling you to easily build up a song from sections - but there's no advanced stuff like pitch-shifting or time-stretching. As for mixing, you get high and low EQ knobs on each playback channel plus panning and one effects send. With both machines this effects send can be used to access an external effects processor with its output being brought back into the left and right return sockets. You have several choices when your mix is ready - the audio can be sent directly to the audio outputs, but can also be recorded internally onto the stereo master track. Once it exists on the master track the mix can then be sent to the outputs for recording by an external recorder or it can be transferred to a computer via the USB connection. Tascam has always intended its Portastudio range to be as simple to use as possible and the DP-02CF is no exception. The goal, of recording in the most straightforward manner that digital technology allows, is achieved through a practical user-interface with lots of physical knobs for dedicated functions wherever possible rather than data wheels and menus. There have to be data wheels and menus for some of the functions, but their implementation here is pretty intuitive - it doesn't take long to get the measure of these machines. However, it has to be said that the display is a little on the small side and difficult to see unless you are right on top of the machine - although the display is backlit, it's a shame it isn't angled up slightly. Sound-wise, the preamps in the two input channels seem well up to scratch so the recorded audio quality is really good in both machines. Once all the recording and editing is done, mixing is very much hands-on with the knobs and fader on each channel. The EQ knobs each work nicely at the well-chosen default frequency, but this is not fixed and it's a simple matter to delve into the menu and choose a different frequency for each knob - a great help when mixing and getting sounds to sit together. The emphasis is on the recording of quality audio rather than providing an all-in-one production workstation with drum and maybe bass programming - if you are looking for those facilities you will need to look elsewhere. However, if you have your own drum machine or are happy with a metronome, this machine could be a sound choice for easily knocking your ideas into shape or creating demos. The DP-02CF may appeal to those on a budget or those who already have an amp simulator, effects processor and a computer to burn CDs.